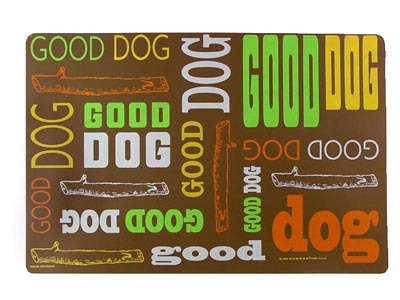 Traced with a random design of ‘stick’ and ‘good dog’ screened in citrus colors against a brown field, this feeding mat comes in two sizes to accommodate large (or especially ravenous) dogs or multiple pets. The jumbo mat can fit two of our large-sized bowls side by side. For companion ‘stick’ logo bowl, click here.